Kindergarten through sixth grade students had an opportunity to view the solar eclipse in the Cave Creek Unified School District. Staff and parents were present to make sure that proper eyewear was utilized while students studied this awesome event. 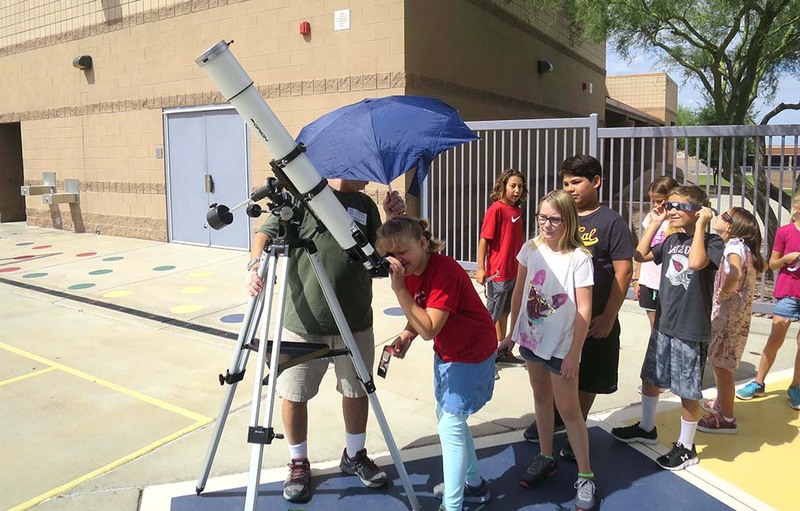 Parents at Lone Mountain Elementary School, Dr. & Mrs. Jaramillo brought in and setup their high-powered telescope with appropriate filters for students and staff to view the eclipse. They took pictures through the telescope and tracked the solar eclipse progression. Photos can be seen on the Lone Mountain Twitter Account @LMESEagles1, CCUSD’s Facebook, Instagram and Twitter feeds. Lone Mountain Elementary School is a STEM school with strong partnerships with the Arizona Science Center and Kiwanis of Carefree. For more information contact the school at 480-437-3000.